Comfort, security and personalization for an attractive price. Compositi presents you with Ellipse, the new generation of safety stirrups and thus the best product in the new Performance range. The design meets the expectations of all riders and offers maximum safety and comfort. The C-shaped metal core consists of material with memory and passes under the footbed. This creates a flexible support without any weak points. It has been tested and approved by several test centers, where more than one hundred thousand repetitions were performed. In case of a fall, the flexible side of the stirrup opens to release the rider’s foot. With the wide and shock-absorbing base, comfort is guaranteed. There are two models available. The Soft, with a comfortable, softer footbed and the Pro, with stainless steel spikes for ultimate grip. 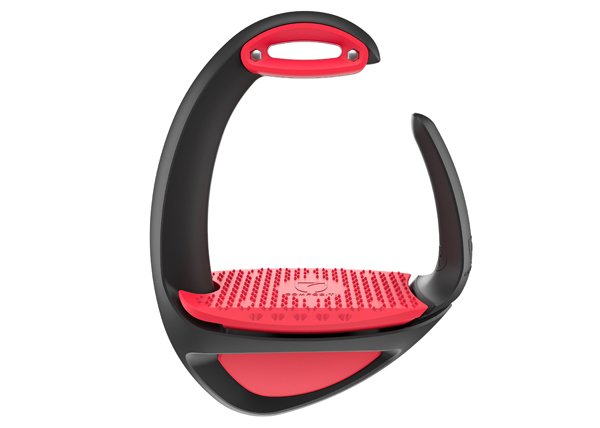 Because of the interchangeable slots for the straps, the rider can choose between a neutral or square stirrup position. With fifteen different colors, the stirrup can be adjusted to your own taste.